Richard White Wolfe was born on August 25, 1866, at the Glen, the family farm near Cratloe, Parish of Athea, County Limerick, the son of Richard E. Wolfe, a Catholic farmer, and Catherine White Wolfe. Wolfe's siblings included Maurice Richard (b. 1853), Ellen “Nellie” (b. 1858), Patrick Richard (b. 1861), John W. (b. 1864), Catherine (b. 1868), Mary A. (b. 1870), Michael (b. 1870), Johanna (b. 1873), and Nano. Wolfe’s obituary in the New York Times mentioned that he “was a descendant of Gen. James Wolfe, conqueror of Quebec,” likely referring to stories surrounding Captain George Wolfe. From about 1873 to 1878 Wolfe attended classes at a school his father founded at the Glen. As this account from Ireland's National Folklore Project attests, it began as a hedge school but evolved into something slightly more modern. Wolfe then graduated to the Ballagh Townland school and the National School in Athea. Wolfe immigrated to the United States in 1885. A later passport application indicates that he left Queenstown, County Cork, on May 1, 1885, on a ship owned by the Cunard Steamship Company. The American destination is unclear. Wolfe appears to have been joined by several of his siblings. 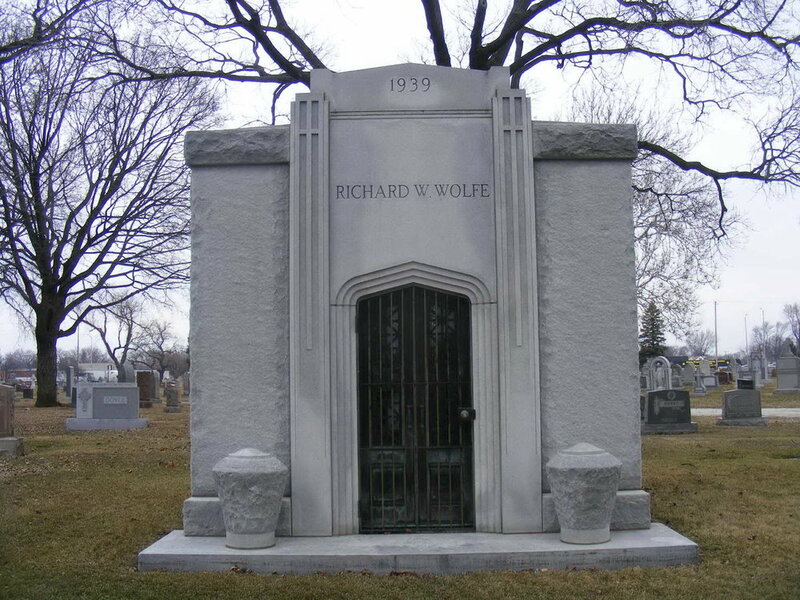 By 1900, Patrick Wolfe had settled in Philadelphia, Pennsylvania, while other family members, including Richard Wolfe, lived in Chicago, Illinois. Wolfe’s uncle, John E. Wolfe, immigrated sometime around 1850, traveling first to LaSalle County, Illinois, and then to Clinton County, Iowa. Richard Wolfe became a naturalized U.S. citizen in Cook County, Illinois, on April 20, 1891. His passport application, dated May 12, 1902, describes him as a real estate broker, five feet nine inches tall, with a high forehead, blue eyes, a long and drooping nose, a “rather small” mouth, an average chin, brown hair, and fair complexion. On September 22, 1897, Wolfe married Helen Lenz, a native of Illinois, in Chicago. The couple had one child, Grace (b. 1902). Prior to taking public office, Wolfe worked in real estate, partnering first with E. B. Roy and then with William F. Friedman. He also served as president of the Real Estate Nonpartisan League, which endorsed William Hale “Big Bill” Thompson, a Republican, in his run for a second term as mayor of Chicago in 1919. Wolfe served as president of the Cook County Real Estate Board and sat on the city’s original zoning commission. In 1903, he joined the newly formed William Randolph Hearst League, which supported the newspaper publisher, then a Democratic member of the U.S. House of Representatives, for president. Hearst, who did not run, was known for his anti-British views. Such views were shared by Wolfe, who later in his career publicly decried the king of England’s undue influence on Capitol Hill. Wolfe’s antipathy for the king likely was related to his Irish upbringing, and he was active in Irish American affairs in Chicago. He was a member of the Irish Educational Association and, in 1903, was elected treasurer of the Sheridan Club, a fraternal organization of Irish Americans established in 1888 and headquartered in a substantial, three-story building on Michigan Avenue at 41st Street. In 1904, Wolfe was named in a lawsuit against the club initiated by a printing company to which the club owed $310. Wolfe was among a handful of club members in arrears for their dues. Wolfe also served as secretary of the Irish Freedom Fund, a Chicago organization that advocated for an Irish republic. In 1924, he served as national treasurer of the Progressive Party, a third party formed by Senator Robert M. La Follette, of Wisconsin, as part of his failed bid for president. During Big Bill Thompson’s run for a third term as mayor, Wolfe served as the candidate’s “orator and wordsmith,” in the words of the historian Gerald Leinwand. Thompson ran in part on an America First, anti-British platform, aided by Wolfe’s sometimes inflammatory rhetoric. “Capitol hill is influenced by the king of England,” Wolfe wrote in a campaign flyer, “while the plain people are guided by the teachings of Washington, Jefferson, and Lincoln.” He vowed that Thompson would “uphold the Americanism of the fathers.” And indeed the mayor later did. Once in office again, he threatened to burn any anti-American, not-100-percent-American, or pro-British books in the Chicago Public Library. After Thompson’s election in 1927, the mayor appointed Wolfe commissioner of public works. His tenure was marked by continued efforts to straighten the Chicago River in its course from the North Shore Channel to Belmont Street, the establishment of a water-filtration system, and controversies over the condition of city streets. Complicating these issues was the air of corruption that surrounded the mayor’s office, which many assumed to be on the payroll of the mobster Al Capone. A month earlier, a man was murdered under circumstances that seemed especially damning for Wolfe. On March 5 the Illinois state’s attorney announced the resumption of a probe of city hall payroll records. Looking for evidence of graft and payroll padding, he subpoenaed the appropriate records from Wolfe’s office and was promised cooperation. When he did not receive it, he informed a judge of his intention to confiscate the records from their storage place in a garage on West Harrison Street. Before he could do so, on March 9, two gunmen entered the garage in a failed attempt to abscond with the records and killed a sixty-two-year-old night watchman. The next day the records were under the protection of a city police detective when a man dressed as a police officer attempted to obtain the records, using the name of Commissioner Wolfe. He even telephoned a person who claimed to be the commissioner, but he, too, failed to get the records. The state’s attorney’s office, meanwhile, linked the owner of the garage, Charles E. Patterson, to Wolfe and found that Patterson had been earning about $4,000 a month from the city for minimal services. In February 1931, Thompson and Wolfe were both investigated for diverting to their own coffers most of the $139,772 raised in a flood-relief campaign. Wolfe, in particular, was fingered as the one to whom the money was entrusted. On February 9, 1931, the Tribune published images of canceled checks and a bank statement, signed by Wolfe, all suggesting that relief money had been used for political purposes. At the same time, the state’s attorney’s office opened a separate investigation into allegations of corruption in the finances of the river-straightening project. Not long after that, Wolfe was again accused of mishandling finances, with aldermen charging that he neglected to collect $30,000 in rent owed by a transit company for space leased at Navy Pier. Thompson failed to win election to a fourth term in April 1931. In May, Wolfe appeared before a grand jury investigating the city’s books. He denied receiving illicit money from Capone, but did testify that he and seven others, some of whom were outside of government, all attended a midnight meeting in which they each contributed $5,000 toward a $40,000 shortfall in the accounts of an unnamed city employee. The reason for the shortfall was not made clear, and favors paid to those who contributed were assumed. In June, Wolfe was charged with another misdeed, this time conspiring to commit fraud on a civil service examination in order to fill a city position with a favored employee. None of the accusations against Wolfe led to a criminal conviction, and the taint of unethical behavior that dogged him in office was not mentioned in obituaries that later appeared in the Chicago Tribune and the New York Times. Wolfe died on March 29, 1951, at South Chicago Community Hospital. His wife died on January 8, 1961. They are buried together at Holy Sepulchre Cemetery in Alsip, Cook County, Illinois.